American Carpatho-Russian Orthodox Diocese of North America | Our Thoughts Determine Our Lives: The Life and Teaching of Elder Thaddeus of Vitovnica. Home » Organizations & Institutions » Diocesan Priest Wives » Book Reviews » Our Thoughts Determine Our Lives: The Life and Teaching of Elder Thaddeus of Vitovnica. My dad called me one afternoon with the specific purpose of sharing the above quote. This teaching is repeated countless times in the book, Our Thoughts Determine Our Lives: the Life and Teaching of Elder Thaddeus of Vitovnica. The teachings of Elder Thaddeus seem so simple until they are shocking and humbling. He explains how to control our thoughts while teaching that a healthy relationship with Christ begins with a softened heart. He addresses normal struggles like conflict between mother-in-laws and daughter-in-laws, the torment of the workplace and the frustration of families. His teachings show how knowing God’s love, peace, and joy is not about an in-depth study of theology but is about putting Christ in the center of our lives—beginning with our thoughts. He asserts that when we are dissatisfied or angry, our thoughts also wage war. When we have hurtful thoughts about others (even if kept to ourselves), we are physically hurting those people as a direct consequence of our thoughts. Our thoughts alone, without verbalization or action, communicate peace or conflict, virtue or sin. Elder Thaddeus attests that everyone around us can see our internal state. If in each family there was just one person who served God zealously, what harmony there would be in the world! I often remember the story of Sister J. She used to come and talk to me often while I was still at the Tumane Monastery. Once she came together with an organized group of pilgrims and complained, saying, “I can’t bear this any longer! People are just so unkind to each other!” She went on to say that she was going to look for another job. I advised her against it, as there were few jobs and a high level of unemployment. I told her to stop the war she was fighting with her colleagues. “But I’m not fighting with anyone she said. I explained that, although she was not fighting physically she was waging war on her colleagues in her thoughts by being dissatisfied with her position. She argued that it was beyond anyone’s endurance. “Of course it is,” I told her, “but you can’t do it yourself. You need God’s help. No one knows whether you are praying or not while you are at work. So when they start offending you, do not return their offenses either with words or with negative thoughts. Try not to offend them even in your thoughts; pray to God that He may send them an angel of peace. Also ask that He not forget you. You will not be able to do this immediately, but if you always pray like that, you will see how things will change over time and how the people will change as well. In fact, you are going to change, too.” At that time I did not know whether she was going to need my advice. This happened in the Tumane Monastery in 1980. In 1981 I was sent to the Vitovnica Monastery. I was standing underneath the quince tree when I noticed a group of pilgrims that had arrived. She was in the group and she came up to me to receive a blessing. And this is what she said to me, “Oh, Father, I had no idea that people were so good!” I asked her whether was referring to her colleagues at work and she said she was. “They have changed so much, Father, it’s unbelievable! No one offends me anymore, and I can see the change in myself, as well.” I asked her whether she was at peace with everyone, and she answered that there was one person with whom she could not make peace for a long time. Then, as she read the Gospels, she came to the part where the Lord commands us to love your enemies. Then she said to herself, “You are going to love this person whether you want to or not, because this is what the Lord commands us to do.” And now, you see, they are best friends! If there were just one such person in every company, factory or office! That would be the way towards peace. Only one person who is prayerfully connected to God is needed, and we will have peace everywhere—in the family, at work, in the government, and everywhere. It is in the presence of such a person that we are freed from gloomy and cumbersome thoughts. How do our thoughts wage war against others? Let us pray that God send angels of peace to our co-workers, friends, family members and government representatives so that we can begin to see harmony in the world. 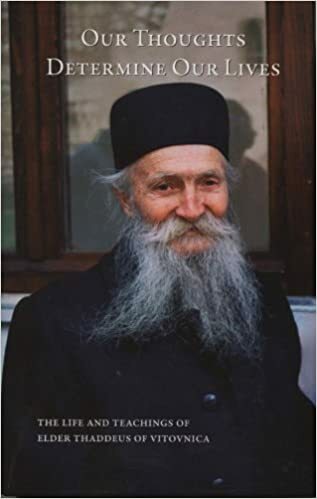 Our Thoughts Determine Our Lives: the life and teaching of Elder Thaddeus of Vitovnica / complied by the St. Herman of Alaska Brotherhood; translated by Ana Smilganic. Platina, CA: St. Hermon of Alaska Brotherhood, 2009 (93-94).